If you are still standing after 4 straight days of punishing your body with running around, gigs and libations at SXSW and are no worse for wear, then you deserve a gold star. I’ll be the first to admit, Friday night…er, in the wee hours of Saturday morning I didn’t crawl into bed until about 6 AM after a very enjoyable night of dancing and boozing, having been taken out as a very special guest by some boys in a band I’m fond of. Ahem. I won’t embarrass by naming them but they know who they are, and if you are reading this my friends, that was truly one of the most fun nights of my life. Cheers for that. I owe you one when you make your first triumphant visit to DC. I had such a good time on Friday night and gosh darn it, it was my last full day in Austin on Saturday the 16th, and I was going to give myself the gift of a nice lie-in. I had been invited to see Dan Croll at noon, but my argument was that he was going to be at Liverpool Sound City where we’re having a stage and I’d have a chance to see him then, and since he now has an American record contract (so I heard?) I will see him on this side of the pond eventually anyway. I had made a promise to Larry and Johnny of our friends the AU Review to check out the Aussie BBQ this year, since I didn’t have time in 2012, so I stopped into Maggie Mae’s, where I was overwhelmed with all the Australian talent that was going to be showcased across the three stages there. I used to think the Brits were the only country to have an awe-inspiring presence at SXSW, but Australia makes good work of taking up the entire last day of the festival to showcase their country’s musical best. See all of the AU Review’s excellent coverage of this year’s Aussie BBQ, as well as previous years, through this link. After popping my head in to say hello to Larry between his very busy schedule of video interviews, I went looking for Johnny, who was tasked to take photos of bands on all three stages. 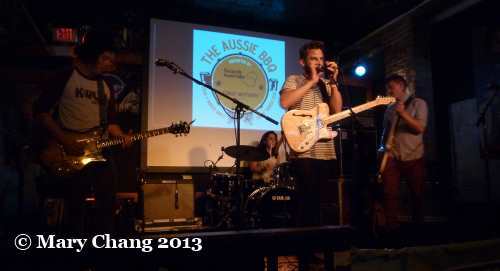 When I couldn’t find him, I went downstairs to enjoy a bit of Bearhug, an alt-rock band from Sydney. Kind of slacker rock / Lemonheads sounding. Then I went upstairs to catch a bit of indie band the Rubens, who I saw at the triplej Unearthed night at the Oxford Art Factory during ARIA Week in Sydney last November. I was hoping to see if I would change my mind on them, given that they were playing in an entirely different environment. Nope. ‘My Gun’ still sounds cheesy and a poor man’s Oasis. Sorry, guys. After a brief catch-up, some laughs and hugs and wishes for each other for safe travels home, I was off to my next destination. Emails had flitted back and forth in my inbox the previous night before and after I caught some shut eye, and suddenly I found myself being invited to see a couple different bands at a free showcase on Sixth Street. 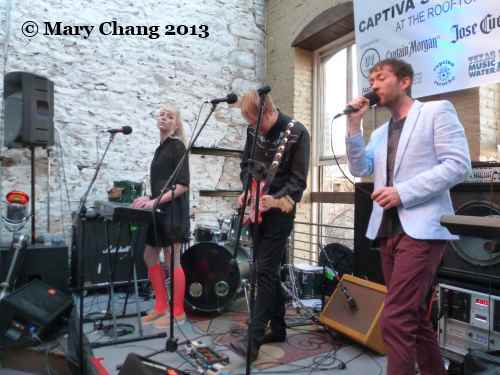 As fate should have it, all three of the bands happened to be playing at the same exact showcase being put on by Captiva Records, a music promotion and indie record label based locally in San Marcos, Texas, taking place on the Rooftop at 6th. I am not sure who decided which bands would play on their afternoon shows that went on all week, as at least on Satruday there was no emcee present or anyone who looked like he or she was running the show. Whoever it was though, he/she did an impeccable job of choosing some great artists to play, especially on the Saturday. The next band was Kent’s Story Books, who if you recall, I saw on the Wednesday night Communion showcase at Maggie Mae’s Rooftop and then interviewed three of the band on Thursday at Blackheart. The show at night was miles away from this last hurrah for the band, playing in the sunshine. I guess you could say that the Austin sunshine is something magical indeed. 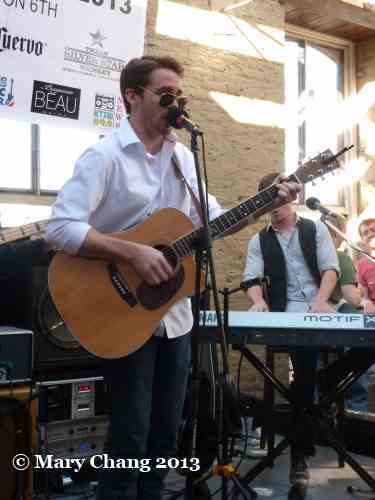 Their keyboardist Andrew was even wearing sunglasses for the entire set. (Well, almost. Afterwards he said, “I tried, but they kept slipping off my face”. And it’s the trying that counts.) ‘Simple Kids’, from their debut EP ‘To Be a Hunter’ on Communion to be released on the 29th of April, is a melancholy number about young love and how Kris Harris insists, “stay close to your troubles, don’t let them interfere/ with your sense of wonder, ’til it disappears”. Which is what being young and falling in love is all about, right? I think though in Story Books’ case, what got punters into the band was the reckless abandon in which Harris and guitarist Jack Tarrant banged on their guitars. No, sir. This is not just a folk band. Cross those words out and write underneath “rocking out band with folk tendencies”. That’s more accurate. Okay, so here’s my entirely unbiased opinion on this band after hearing them play. Point #1: I don’t know how long they’ve been together or have known each other, but it doesn’t engender much confidence if when you’re playing SXSW, you have to make a point to acknowledge that your next song “is an original”. This made me think most of their arsenal is made up of covers. Huh? Point #2: I didn’t find anything particularly exciting or noteworthy about their set. They’ve also got a vague country/western twangy vibe, which generally doesn’t go down well with me. The good news though is, the band are still in university and have plenty of time to find their sound – or rather a unique sound that will set them apart from any other American band from Anytown, USA. I wish them luck. And then for the third time in 24 hours, it was again Crookes time. 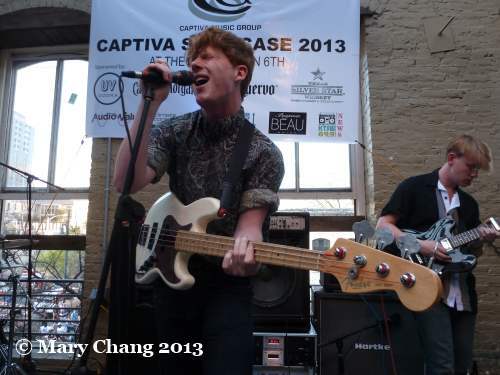 It was their fifth and final show of this SXSW and well, it’s like they say: go big or go home. Guitarist Tom Dakin and singer/bassist George Waite were dressed in colourful shirts they’d purchased in Austin; Tom’s, with a tropical flower theme, was most appropriate for playing a gig under the gaze of late afternoon sun. Out the gate they played ‘Where Did Our Love Go’ with so much gusto, it probably caused this neck ligament accident reported a couple days ago on Twitter. 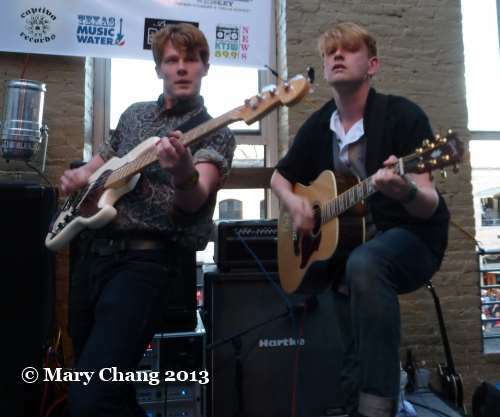 On behalf of America, I wholly apologise to the band and the whole of England for any injury caused by SXSW. But it was a wild week of shows, wasn’t it? Trust me, I know. I almost got impaled by George’s wayward mike stand. Last year I had a close call with one of Cashier No. 9‘s guitars. I’ve questioned the wisdom of posting a video of mine of them playing ‘Backstreet Lovers’ because you can hear me singing along a little bit too loudly. There is also a lot of arms and legs flailing from the vocal Crookes’ American fan contingent described previously in Friday night’s review. Our crowd’s singing along was even more evident during the Crookes’ foray onto the atrium platform to perform ‘The Cooler King’, with Tom quipping and pointing at all of us, “you’re our official back-up section!” But what was more important was the amount of cheering and hollering the band got not from us, but from people who had just a half-hour before had never heard of the Crookes before. 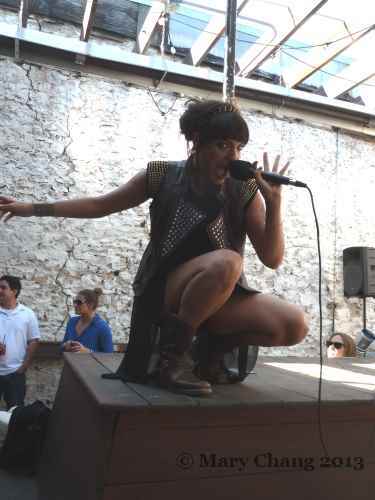 Maybe this best exemplifies why SXSW is like Christmas to music lovers: keep your ears open, take a chance on a band playing in the sun on a rooftop, and you might just have stumbled on your new favourite band. After the sweat-athon that was the Crookes’ set, there was a brief changeover before the Ghosts, who became the last band I would see at SXSW. They’re a project that was started by Alex Starling, who was a supposed “secret” fourth member of the all too short-lived Ou Est Le Swimming Pool, who disbanded following their singer Charles Haddon’s tragic suicide at 2010’s Pukkelpop in Belgium. Out of tragedy, Starling didn’t wallow in his sorrow long. He regrouped, joined forces with drummer Ian Palmer, then headed west to North America to pick up some additional band members. There’s a roughness, a hardness to their sound, relying on guitars, synths and drums to make something like single ‘Everything Will Do’, with sections loud and punishing like Led Zeppelin’s height of grandeur, interspersed only slightly softer moments. At other times, they’re definitely channeling the most fun aspects of ’80s New Wave dance (have a listen to ‘Underrated’), and as a connoisseur of that era, I can appreciate this fully. 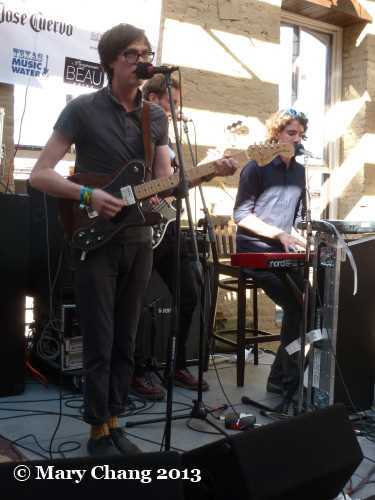 It’s definitely a unique style, and I’m glad it just so happened that I got to see them at the conclusion of my SXSW 2013 experience.